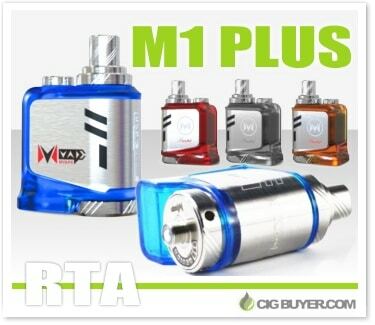 The Mvape M1 Plus RTA Tank is a unique rebuildable atomizer that sports an astounding 10ml of e-juice capacity. Supporting wattages from 20 – 200W, it’s unique shape and 25mm diameter should fit nicely on most larger box mods, and its stylish appearance will certainly add some flair. Constructed from stainless steel with a colored polycarbonate tank, it comes with a rebuildable atomizer head for creating your own custom builds, as well as a pre-built 0.1 ohm Ni200 coil.